QUETTA: Leaders of the Pakistan Tehreek-i-Insaf has succeeded in winning support of three out of six parties that are part of the coalition government in Balochistan for PTI’s presidential candidate Dr Arif Alvi. The election for president will be held on Sept 4. A delegation of the PTI leaders comprising Jahangir Tareen, Defence Minister Pervez Khattak, Sindh Governor Imran Ismail and Dr Alvi arrived here on Wednesday and held meetings with leaders of different political parties to win their support for the PTI’s presidential candidate. The three parties which backed the PTI candidate for the presidential election are Balochistan Awami Party (BAP), Hazara Democratic Party (HDP) and Jamhoori Watan Party (JWP). 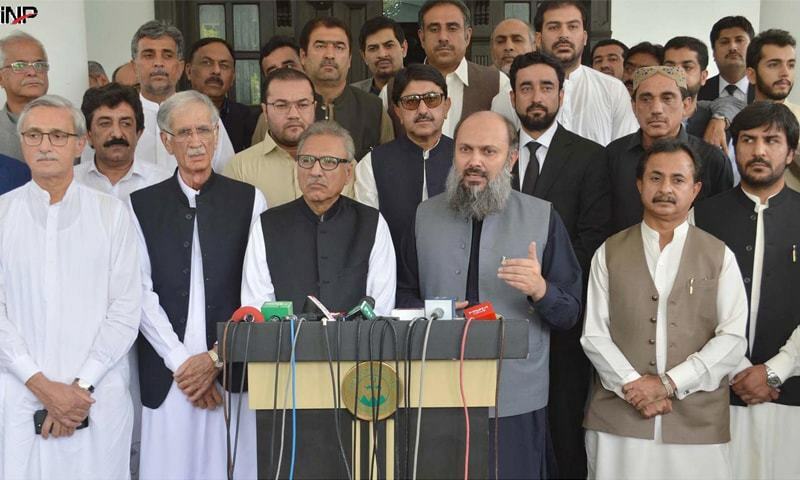 Although the Awami National Party (ANP) is part of the six-party coalition government in Balochistan, it is sitting on opposition benches in the National Assembly and Khyber Pakhtunkhwa Assembly. The PTI leaders also held a meeting with the chief minister and president of Balochistan Awami Party (BAP) at the Chief Minister House and sought his party’s support for the PTI candidate. PTI’s provincial president Sardar Yar Muhammad Rind did not attend the meeting. Speaking at a press conference after the meeting with the PTI’s senior leaders, Chief Minister Jam Mir Kamal Khan Alyani announced BAP’s full support for Dr Alvi in the presidential election. He said Prime Minister Imran Khan had extended full support to the Balochistan Awami Party in the formation of a BAP-led coalition government in the province. “In view of Mr Khan’s support, we seek to strengthen our coalition with the PTI on national and provincial levels,” Mr Alyani said. He said that BAP had emerged as the largest party of the province and it also had a sizable representation in both houses of parliament. “Our party will play an important role in the presidential election,” the chief minister said. Speaking on the occasion, PTI’s presidential candidate Dr Arif Alvi thanked the Balochistan Awami Party for its support. He said that PTI chief Imran Khan had promised to the people of Balochistan that he would bring about a positive change in the lives of the people of Balochistan and end their sense of deprivation. Later, the PTI leaders visited the office of HDP and held a meeting with its president Abdul Khaliq Hazara and other leaders and requested for the party’s support in the presidential election. The HDP president assured full support to the PTI candidate. The PTI leaders then met president of the Jamhoori Watan Party Nawabzada Shahzain Bugti at the Bugti House and sought his support for Dr Alvi. Mr Bugti announced his support for the PTI candidate, but sought support of the PTI in solution of problems being faced by the people of the Bugti tribe. The PTI leaders assured the JWP president that the federal government would take necessary steps to solve their all problems.